Encore at Eastmark is a 55+ community located in Mesa, Arizona. Encore is the age-restricted neighborhood within the master-planned community of Eastmark. Encore at Eastmark opened in early 2015, and upon completion, this modern neighborhood will feature 973 single-family homes. 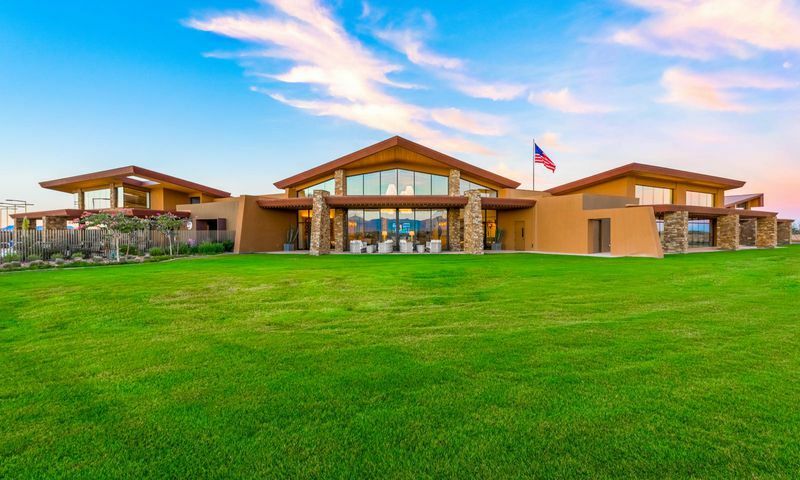 Located outside of Phoenix, Eastmark spans a scenic 3,200 acres in Central Arizona. Conveniently located in Mesa, Arizona, Encore at Eastmark is near a variety of attractions and local culture. From museums to world-class dining, there is plenty to do and nearby airports make travel easy. Encore at Eastmark encompasses all of the amenities one would expect in an active adult community. The 15,000 square-foot Encore Club serves as the social hub for residents, offering social spaces such as classrooms and billiards tables as gathering points. Residents can improve their health in the state-of-the-art fitness center, or relax with friends in the cafe. An arts and crafts studio, as well as a library, provide residents with a number of creative outlets. Outdoors, residents have no shortage of ways to stay active. A resort-style pool and spa make for an ideal way to enjoy the warm Arizona weather, and an outdoor patio with firepits is a great place to catch up with friends and neighbors. Fans of any sport will be appeased by the tennis, bocce ball and pickleball courts. Finally, an event lawn makes it easy to host guests on the community grounds. Encore at Eastmark offers homes on a new construction basis, with sixteen different models from which to choose. AV Homes began construction in 2015 before the builder was purchased by Taylor Morrison, and by completion, the neighborhood will feature approximately 973 single-family homes. All models feature two bedrooms, and two or two-and-a-half bathrooms. All residences feature an attached garage as well, ranging in size from two-car to three-car. Homes feature outdoor living spaces so residents can make the most of the warm climate. All single-level homes are low-maintenance and perfect for the active adult. Homeowners' association fees mean that residents of Encore at Eastmark can spend their time enjoying retirement without worrying about tedious home maintenance. Active adults are drawn to the carefree, exciting lifestyle of Encore at Eastmark. Residents can partake in as many or as few activities as they see fit, but there are options for every interest. Animal lovers can try the dog walking group. Fitness buffs have a variety of classes to choose from, as well as walking and bicycling interest groups. Residents can get their game on with regular bunco, poker, and Mah Jongg, while crafty types can spend their time in jewelry making or scrapbooking. For special occasions, the community often holds events like BBQs or ice cream socials to bring neighbors together. Phoenix-based active adults and snowbirds alike are sure to enjoy Encore's prime location in Maricopa County. Easy access to major roadways as well as close proximity to the Phoenix-Mesa Gateway Airport makes it easy to travel any time of year. Encore is part of Eastmark, a master-planned community. There are numerous golf courses, shopping opportunities, and endless outdoor recreation options easily accessible throughout the area. The Arizona Museum of Natural History is located right in Mesa, as well as the Mesa Arts Center, putting residents conveniently amidst Arizona culture. Mesa is also home to a variety of hotels, making hosting visitors easier than ever. Mesa is a hub of world-class dining and nightlife, well-known for its Southwestern fare. Baseball fans have a lot to celebrate in Mesa, as it is the home to the spring training centers of both the Chicago Cubs and the Oakland Athletics. With so many entertainment options right in town, Encore at Eastmark makes for the perfect active adult oasis in Central Arizona. Encore Center - 15,000 sq. ft. There are plenty of activities available in Encore at Eastmark. Here is a sample of some of the clubs, activities and classes offered here. The Composer Series by Taylor Morrison features 4 different home designs, ranging in price from the low to mid-200's. The models vary in size anywhere between 1,339 and 1,828 square feet and feature two bedrooms as well as two bathrooms. The Director Series by Taylor Morrison offers four distinct models for every homebuyer taste. Varying in price from the mid to high 200's, the plans also range from 1,761 to 2,112 square feet in size. Designs feature two bedrooms plus a den, as well as two to two-and-a-half bathrooms. The Producer Series from Taylor Morrison offers homebuyers four floor plan options for a variety of preferences. These single-family homes offer two bedrooms plus a den, and two-and-a-half bathrooms. As for size, designs vary from 2,313 to 3,205 square feet. The two model Executive Series from Taylor Morrison features homes starting in the mid-300's. These home options range from 2,902 to 3,088 square feet with two bedrooms and a den. Plans also feature two-and-a-half bathrooms. We love living here but have been disappointed with some quality issues in our home and the response from the builder. Here is an example: We purchased an extended patio with triple sliders and a built-in fireplace. We also purchased the option to mount a TV over the fireplace and invited friends and family over for Thanksgiving. We had the football game and fireplace on and someone noticed the TV was sagging. When i felt the TV it was extremely hot and was melting! I shut off the fireplace and the TV continued to sag until it was tipped at about 45 degrees. I took pictures, informed the builder and even showed him the damage to the TV. He said no one else has had this issue, there was nothing wrong with the fireplace and his solution was to add a concrete mantel to block the heat! We love living here. Good experience with the builder, happy with our home. Good social activities and great clubhouse amenities. All the floor plans are extremely well thought out, the community is lovely, lots of activities. Tiny houses, very tiny lots big house prices. Great new community. Very upscale but affordable. We would love to live here once our home sells. The amount of things to keep you busy is amazing and we love being outside so the views of the Superstition Mountains is a big attraction for us. Lovely community with lots to do. The builder makes a great home and the clubhouse is brand new with so many great features to it. 55places.com is not affiliated with the developer(s) or homeowners association of Encore at Eastmark. The information you submit is distributed to a 55places.com Partner Agent, who is a licensed real estate agent. The information regarding Encore at Eastmark has not been verified or approved by the developer or homeowners association. Please verify all information prior to purchasing. 55places.com is not responsible for any errors regarding the information displayed on this website.